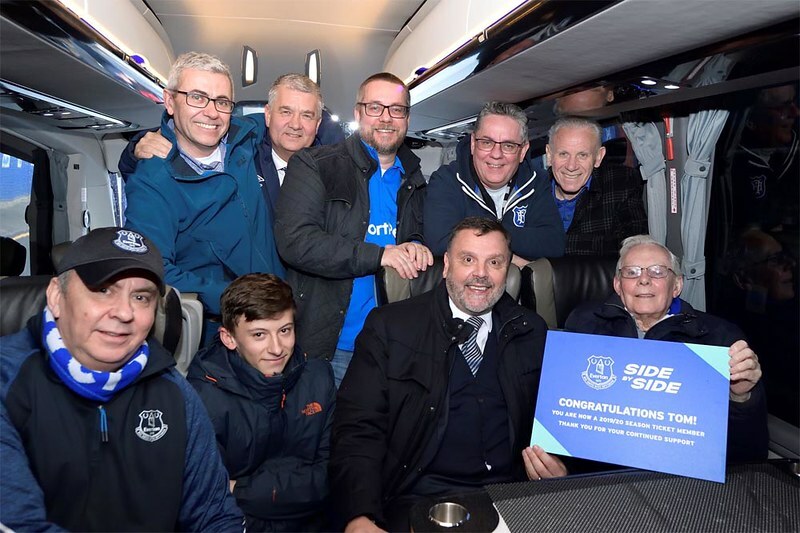 A 90-year-old Season Ticket Member enjoyed a VIP journey to Goodison Park for last weekend's 2-0 victory over Chelsea after he was picked up by the Club's team bus and surprised by his Blues heroes Peter Reid and Graeme Sharp. Tom Walker, a father of 11 originally from Everton, was stunned to see the luxury coach pull up outside his home in Upton, Merseyside, having been told the Club had arranged his travel for the visit of Maurizio Sarri's side. 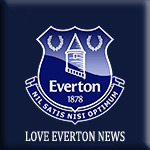 The lifelong Blue, whose all-time hero was war-time defender TG Jones, has recently moved to the accessibility seating in Goodison Park's Howard Kendall Gwladys Street stand and believed the offer of transport was a one-off benefit. However, Tom, who first attended a game at Goodison aged eight and watched Dixie Dean from his dad's shoulders in the early 1930s, was shocked to be joined on board by European Cup Winners' Cup winning stars Reid and Sharp as the vehicle made its way to L4. 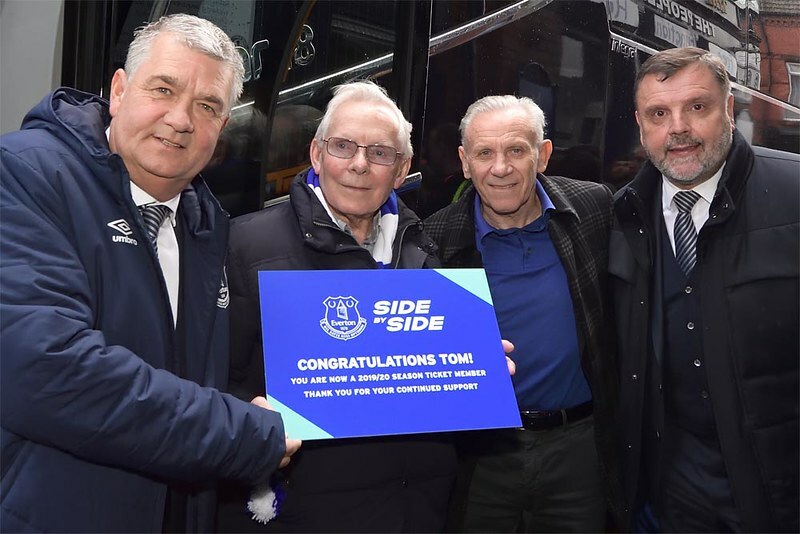 To complete the surprise, Reid and Sharp's 1987 title-winning teammate Ian Snodin met the coach on arrival at Goodison to hand Tom a Season Ticket for 2019/20 as part of the Club's Side By Side campaign. The 2-0 victory, courtesy of second-half strikes from Richarlison and Gylfi Sigurdsson, capped an unforgettable day for the delighted nonagenarian. "Peter Reid, Graeme Sharp, Dixie Dean, Bob Latchford - that's been ingrained in us by dad from when we were kids," said Tom's son Simon, who along with his seven brothers and four sisters had contacted the Club asking if their father could be rewarded for his dedication to the Toffees and raising a family that has since extended to include more than 70 Evertonians. "It's part of us and we've now done the same with our kids," he added. "They get to understand and learn what this club is all about and it's much more than football - it's the social life of our family. "Dad was a shift worker for a lot of years so he'd work mornings, afternoons and nights and there were weeks when we didn't really see a lot of him because he was working so hard to maintain the family. "Our parents spent every penny they had on us. We never went hungry, we were always looked after and we always came to the game - and we're lucky because with 11 kids that wasn't easy." Simon, 60, and his brothers Graham, 64, Phil, 57, and Brian, 54, joined their father on the special coach journey, along with Tom's grandson, George, 17. The family still meet up before every home game and visit the Winslow Hotel pub on Goodison Road as a pre-match ritual before heading to their seats. Phil said: "Those guys [Reid, Sharp and Snodin] were heroes to him and he loved every minute of it. "He was just overwhelmed really and stuck for words unusually for him! When he was passed the Season Ticket, just seeing his face was amazing, it really was. "He loves Everton and he loves to have his family around him and for us to all come to the game is just his thing. "We all love him to bits and to still come here with him for every game is just fantastic." Club Ambassador Sharp added: “It was fantastic to meet Tom and hear all his stories about supporting Everton down the years. He was there at Wembley with us in the 1980s when Reidy and I were playing and it was great to hear his memories of standing on his dad’s shoulders and watching the likes of Dixie Dean, Cyril Lello and TG Jones – players you’re told about when you join this Club. Tom will now be able to look forward to attending each game of next season alongside his family having received his 2019/20 Season Ticket as part of his surprise. Those who do not renew before the deadline risk missing out on watching the Blues at all 19 Premier League home matches next season and lose their seat. After the April 4 deadline has passed and once the seat transfer requests have been dealt with, all non-renewed Season Ticket seats will be made available for those on the Season Ticket waiting list to purchase. If you would like to join the waiting list, visit the Club’s online microsite HERE explaining how the list is categorised and how you can join. Everton 2019-20 Season Ticket Deadline: Thursday 4 April.